It's not easy to keep track of the dozens of different tiny ultra-portable PCs coming onto the market these days. But it's worth remembering that there is life beyond the Asus Eee PC line-up that hogs so much attention. Over in Japan, a niche manufacturer called Kohjinsha has been building midget-gem computers with screens that swivel and fold flat against the keyboard like a tablet for two years now and finding at least as much success there as Asus has in the West. Here's a taster of what the Japanese are lapping up. Kohjinsha's entry-level SA series models start at just ¥70,000 (£339) and are based on a low-power AMD Geode LX800 processor running at 500MHz. It's no speed demon, but the list of features makes it acceptable to many users looking to email and word process on the go. Surprisingly for such a cheap machine, the basic 990g SA configuration has a very comfortable keyboard and a decent helping of RAM and storage space (512MB and 40GB), as well as a respectable four-hour battery life. The touch-sensitive 7-inch 1,024 x 600-pixel screen is common to all the S-series Kohjinsha models, as is 802.11b/g Wi-Fi. There's no optical drive on the low-end machines, but there are plenty of alternatives for a little extra cash. We won't bore you with the details of all nine flavours of the mini PC, but will head straight to the top of the heap and the ¥240,000 (£1,164), 953g SH series models. These beauties replace their spinning hard drives with 32GB solid state disks to keep weight down and battery life up (six hours). Innovatively, however, Kohjinsha also includes a regular 120GB drive inside a cradle that the PC clips into for those times when you need a little extra or to back things up. 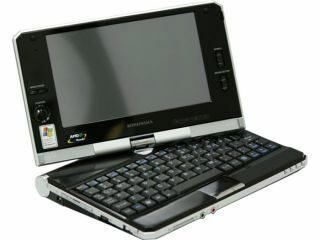 Other features of the SH models include an 800MHz Intel A110 CPU, Windows Vista, a 60GB HDD, 1GB of RAM, a DVD writer, a 7-inch touchscreen, a 1.3-megapixel webcam, MS Office and a 1-seg digital TV tuner. The top-of-the-range machines may be a little pricey, but at least Kohjinsha has attempted to provide something for everyone and it's a formula that seems to work.